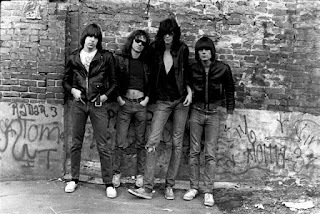 Perhaps someday a CD will appear which compiles all of the RAMONES' early demos in one place, maybe even beefed up with audio from the early videotaped footage of their embryonic appearances at CBGB and Arturo Vega's loft (the only other existent pre-debut LP impressions of the band's music.) Until such day arrives, that over half of these demos are available as bonus tracks for the expanded edition of the first LP is cause for considerable acclaim. That said, the inclusion of this track at this point in the running order is a bit puzzling. This was certainly one of the least impressive of the early studio attempts, and its appearance in lieu of the stunning stabs captured of I DON'T WANNA WALK AROUND WITH YOU or TODAY YOUR LOVE, TOMORROW THE WORLD is questionable, if not borderline tragic. (See RAMONES: THE EARLY DEMOS.) 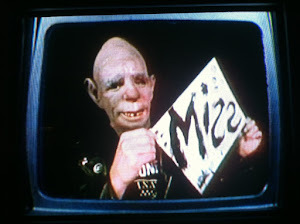 Regardless of quality, like the demo of I DON'T CARE, it would have much more sense to have included this as extra material on the CD of the album it actually appeared on. Amusingly prefaced by a failed take at the quirkily timed intro, this horror themed creation features mostly minor variances from the later release. JOHNNY handles the dynamic drop before the chorus a bit more purposefully, DEEDEE favors his higher strings a bit more determinedly, and the catchy background vocal hook has not yet been actualized. This version does feature one significant difference: the assertive riff following the chorus is a different chord change than what shall be finally used on LEAVE HOME. Surprisingly, this represents the most conspicuous compositional alteration any of the demos suffered on their journey to official studio rendition. Predictably pitched a step lower than the key eventually utilized, YOU SHOULD NEVER HAVE OPENED THAT DOOR not only compares favorably with the debut's clamour, the solid instrument balance also doesn't sound too shabby next to the mix of the second album's closer-- which is a bit vocal heavy and a bit drum light (as we shall soon see, not uncommon problems on the followup.) Still, with plenty of digital space left on the disc the absence of the excess of predominantly superior demos remains a gnawing programming misstep, and the rabid faithful can only lament what could have been until some wise (or simply logical) industry sort intercedes and takes steps to rectify.